This past weekend I went to Connecticut ComiCONN. Last year, it was a one day event at Webster Bank Arena. This year, they expanded to three days at Mohegan Sun, and it was a great decision. While the convention itself has gotten much larger, it's still not the utter crowded chaos that New York Comic Con is, and that ultimately is a good thing. It was a well organized event and Mohegan Sun is an excellent venue. I'll admit, by midday Saturday, I was getting kind of "conned-out." But I took a breather in the casino, played some slots, had a couple of drinks, and after that I was ready to head back in. I guess you can't really nerd out for three days straight. 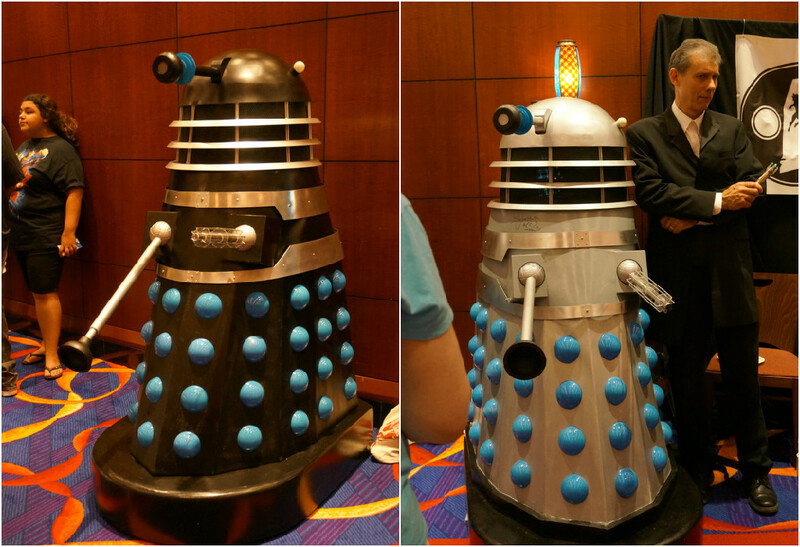 So here are some of the highlights of my Connecticut ComiCONN experience. It's the Batmobile! The car from the 1966 series was on display along with a few cardboard cutouts of the Dynamic Duo. And here's the Batcycle, with Robin's sidecar, along with a cardboard cutout of Batgirl played by Yvonne Craig who just recently passed away. There was a really cool Indiana Jones room. Here's a mockup of the room where Indy finds the location of the Ark complete with mini-city and Indy mannequin. There was also a display case full of Indiana Jones goodies. In it there was the Holy Grail, Indy's whip, the grail diary, the broken tablet, the headpiece to the Staff of Ra, and one of the Sankara Stones. The golden idol from Raiders of the Lost Ark along with the bag of sand Indy tries to swap out for it. Daleks from Doctor Who. These were actually remote controlled so they could move around and their appendages could move as well. In retrospect I probably should have taken some video. Oh, and can't forget the 12th Doctor. A collection of Doctors in front of the TARDIS. Chewbacca looking at a tiny Jango Fett in front of a model of the cockpit of the Millennium Falcon. Some of the inmates at Arkham Asylum with a female Robin. A few cool cosplays. 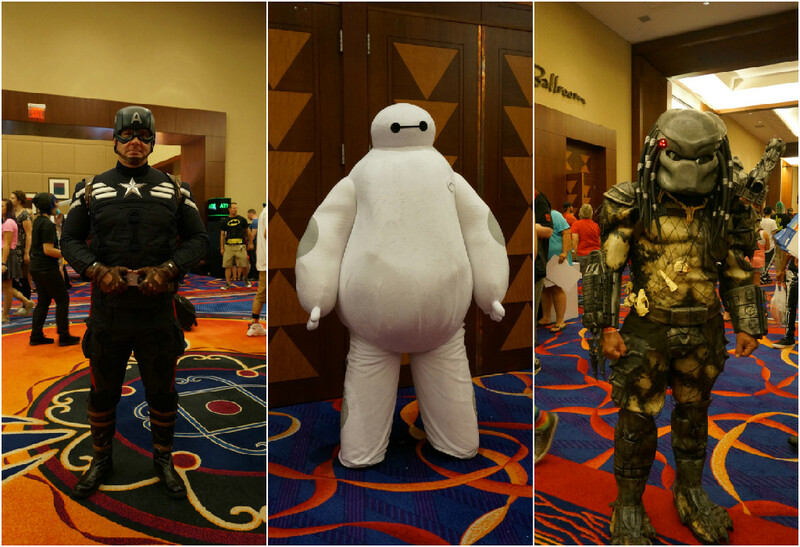 Captain America, Baymax, and the Predator. Here is Saraphina Cosplay dressed up as Queen Mera (Aquaman's wife) and Codex from The Guild. Go follow her on Facebook and Instagram! Here are Instagram users she_loves_fx and Christine Fura as Lady Weeds and Poison Ivy with makeup done by Hillary Hunt. And an awesome Lady Ghost Rider cosplay. I'm trying to identify the cosplayer. If you know, please let me know! Here's a look at just how "crowded" the lobby outside the show floor was. Here's a video I took of an amazing Bumblebee cosplay. I got to meet John Wesley Shipp who was the Flash in the 1990 TV series, and plays the Flash's father in the new series on the CW. Here he is with the Flash Funko he signed. I also got to meet Kevin Conroy, the voice of Batman in pretty much everything and my favorite portrayal of the Dark Knight. And another autographed Funko! 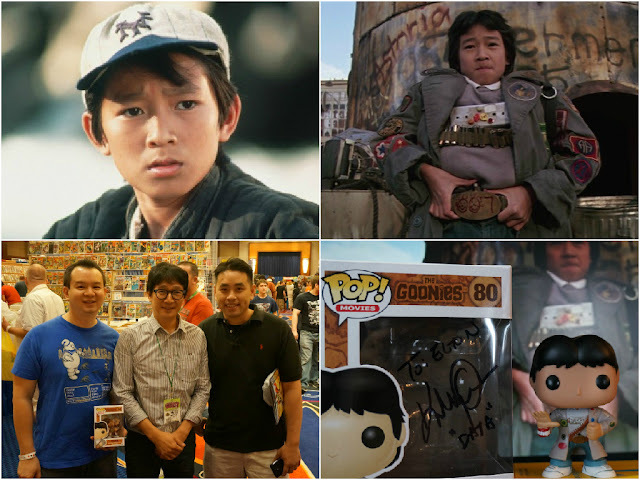 And finally here's Jonathan Ke Huy Quan, who played Short Round in Indiana Jones and the Temple of Doom, and was Data in The Goonies. And a third Funko gets signed! Next year, Connecticut ComiCONN is staying at Mohegan Sun but is rebranding as Terrificon. I guess it's a better way to differentiate itself from other conventions in Connecticut. Go check out their Facebook page. Can't wait!